Last week when I had the pleasure of visiting the residents of Brookridge Heights to talk about My Marquette, we spent a lot of time reminscing about old Marquette hotels, some I knew very little about. Marquette has had numerous old hotels from the Brunswick to the European and the Janzen. Two well-known hotels that I featured in my novels were the Clifton and the Hotel Marquette. Here is the section from My Marquette about them. Photos of the hotels, including the fire one experienced, can be found in My Marquette. Finally, he found Aino Nordmaki in a stairwell and asked her to have supper with him. She tried to explain she could not be involved with the hotel’s male clients. He persisted when her eyes betrayed her pleasure at being asked. He took her to the Hotel Marquette—known for its splendid cuisine—where no one from the Clifton would see them. Aino had never eaten in a restaurant before—she had certainly never dined alone with a man. That he was a giant of a man made her feel both nervous and safe, as if even losing her position at the hotel could not happen if he were with her. They did not talk much; neither knew what to say, but in the end, she thanked him for the meal. The Mesnard House was built in 1883 and renamed the Hotel Marquette in 1891. It had one hundred rooms and was renowned for its fine dining. But like so many other downtown buildings, it would be destroyed by fire in 1930. The Clifton Hotel would be even more ill-fated. The original hotel was first named the Clifton Hostelry, then Cole’s Lake View Hotel, then Cozzen’s Hotel, and finally the Clifton House. It stood four stories high on the corner of Washington and Front Streets, and its top floor and an observation tower provided an excellent view of Lake Superior. A barbershop, billiard parlor, and parlors for entertainment were among its many amenities. A Christmas Day fire in 1886 would destroy it. The Volks, owners of the Clifton, decided to rebuild a block farther up the hill on the corners of Front and Bluff Streets. This second Clifton Hotel would be where Karl and Aino met; they would walk from there down a block to the corner of Washington and Front Streets to the Hotel Marquette for dinner. Meanwhile, Amos Harlow purchased the property where the old Clifton Hotel had stood and built the Harlow Block building in 1887, constructed by Marquette architect Hampson Gregory. It remains home to numerous downtown businesses and offices today. The second Clifton Hotel would ultimately meet the fate of its predecessor. In October 1965, fire again broke out as the result of an electric problem. Despite efforts to put it out, the fire quickly spread through the building. The hotel was never rebuilt. By that time, the US 41 bypass had been built to detour traffic from passing through downtown Marquette. Hotels were being replaced by motels springing up along US 41 as the city grew westward. Today, only the Landmark Inn survives of Marquette’s downtown hotels. Today I had the privilege of being invited to talk to the residents at Brookridge Heights Assisted Living whose reading group has been reading My Marquette. I had a wonderful time getting to meet everyone and hearing many stories of Old Marquette. Many of them could have written their own books. In their honor, here is the section from My Marquette about Brookridge. I grew up by the Crossroads south of town, so whenever I came into Marquette with my parents on County Road 553, I would pass by the old Brookridge estate. I was always a bookworm, always reading in the backseat of the car, but when we approached the curve where the road came into Marquette, I would reverently look up from my book and turn my head to the right where the Brookridge estate stood proudly like some old English estate, the home of a country squire, a carriage house in the back, an apple orchard to the side, and with a lane lined with Lombardy Poplars that led up to the front door. In those days, I felt if I could have lived in any house in Marquette, the Brookridge estate would have been the one. The entire property spoke of a time past, a simpler time that created within me a sort of “Good Old Days” nostalgia. Although it was by then abandoned and a couple of its windows broken, the house’s stately presence could still be felt. I dreamed of the day when I would purchase it and rename it Plumfield after the boys’ school in Louisa May Alcott’s Little Men, one of my favorite books at the time—the ideal place for a boy to grow up. Even when I found out that the Brookridge Estate had originally been the Marquette County Poor Farm, I thought no less of it. If anything, I probably thought that made it all the better—it had been a charitable place, and a farm, and so had Plumfield been as the Bhaers took in boys to their school and turned their lives around. The first poor farm in Marquette began on this site in 1873. In 1900, Marquette residents decided an improved structure was necessary and the new facility, the one I would so grow to love, was built at a cost of $15,000 in 1901. The staunch new building of red brick, sandstone, and yellow trim looked like a giant, solid home, a safe haven. Twenty-seven rooms sat on forty-seven acres of pastures, orchards, and woods surrounded by a brook. The farm produced vegetables and potatoes and even had some cows to produce dairy products. 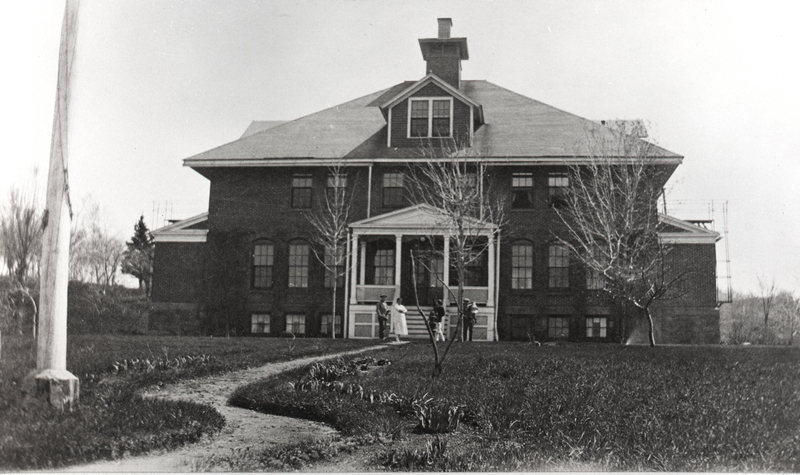 While officially named the Marquette County Citizens’ Home, everyone in Marquette commonly knew it as “the Poor Farm.” Its residents were self-sustaining, taking care of the house and property. Fred Rydholm, local Marquette historian, noted in a 1986 Mining Journal article that his mother worked there as a nurse about 1912 at which time it also served as Marquette’s earliest nursing home, primarily for older people including lumberjacks in their sunset years. At its peak, as many as thirty-five people lived in the house, but by the mid-twentieth century, the population declined. When the building finally closed its doors in 1965, it had only a dozen residents remaining. After a vacancy of four years, the house became a teaching facility, operated by the Marquette Alger Intermediate School District, for emotionally impaired children, at which time it was renamed Brookridge. Funds to sustain the property were so scarce that after a dozen years, the house was closed up. It was during the years it was closed that I remember it. Various attempts were made to save the property as a historical landmark and it was even listed on the National and State Registers of Historic Places for its distinctive early twentieth century architecture. Talk of turning the property into a country inn or a holistic healthcare center fell through in the 1980s. Then in 1994, the property was sold to Marquette General Hospital and the grand old house razed. I was devastated by the tearing down of my dream home. I still have all the articles from The Mining Journal about the debate over what to do with the property and its eventual demolition. I am no poet, but I was moved enough at the time to write a mournful poem over the loss of my imaginary home, which I’ll spare the reader from perusing. Like John Vandelaare in the quotation above, every once in a while I still catch myself in a time warp, turning my head as I drive by to look at the old Brookridge Estate. Since 1998, the modern Brookridge Heights assisted living facility has stood in its place, but in my mind’s eye, the grand old house is still there, waiting for me to ride up to it on my horse and announce I am home like any good English country squire would do. Marquette’s Citadel has stirred up a lot of controversy lately over plans to construct a six story addition to the building. Residents are opposed to the structure because it will block views of Lake Superior and will be out of place with the historical tone of Ridge Street. For more on the controversy, visit http://www.miningjournal.net/page/content.detail/id/547372/Eastside–project-proposed.html. As of today the project is still on hold. The Christian Science community in Marquette was never large, but several of Marquette’s prominent families were members. The church’s history in Marquette is largely tied to the Longyear family. In 1884, the Longyears lost their infant son, John. Mary Longyear was devastated and after seven years of grieving, she turned to Christian Science and found comfort. Her husband, John M. Longyear, remained skeptical of the religion until, as he recorded in his memoirs, he consented to a Christian Science treatment for his bad rheumatism which resulted in his being successfully cured. Although the Longyears would leave Marquette in 1903, Mrs. Longyear would inspire several other residents to believe in Christian Science, and the Longyears would sell a portion of their property to Charles Schaffer, whose new home would be the meeting place for Marquette’s Christian Scientists for many years, starting in 1908. In 1912, the Christian Science congregation began to make plans to build a church and raise funds, but when World War I broke out in 1914, all building was prohibited in the United States. By the time the war was over, the cost of the elaborate structure intended was more than the congregation could afford. After many more years trying to raise money, the congregation consented to a smaller building, which nevertheless would be impressive. 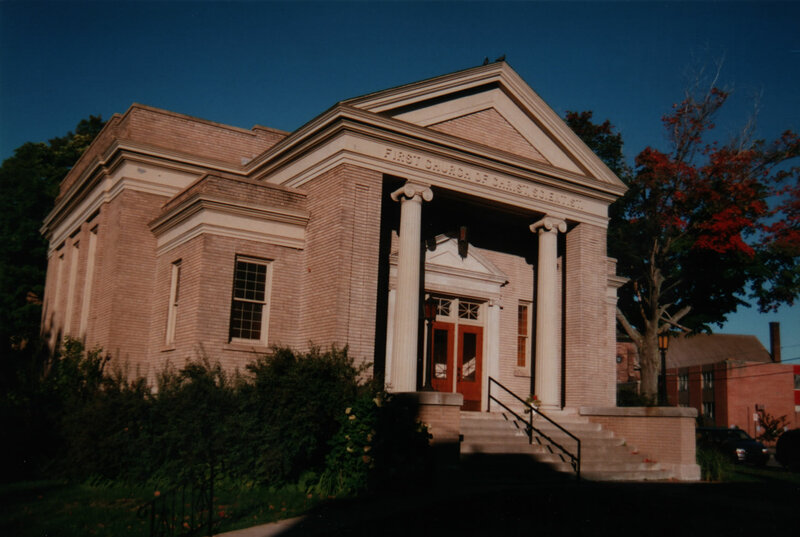 The neo-Greek revival church was constructed in 1925 of gray brick with limestone trim. The main floor auditorium seated 250 people, while downstairs was a Christian Science reading room and the Sunday school. For nearly eighty years, the building would be the congregation’s home, but membership dwindled as time went on, and in 2004, the congregation felt the need to sell the church. Today, the building is known as the “Marquette Citadel” and it functions as a bed and breakfast as well as a place for various functions including wedding receptions and corporate events. The auditorium has been converted into an elegant Victorian style ball room and the downstairs serves as a bed and breakfast with tastefully furnished rooms. While the building no longer serves its original purpose, it has become an elegant place where Mary Beecher Longyear would have felt most comfortable. For more Marquette history, be sure to visit www.MarquetteFiction.com. ChildrenofArthur.com is launched – my new website! I am very pleased to announce the launch of my new website www.ChildrenofArthur.com – King Arthur’s World in Fact and Fiction! This new website will focus upon King Arthur’s Descendants, both in blood and in spirit! I bet many of you did not know King Arthur had children, but the Arthurian legend is rich with obscure stories of Arthur’s descendants, stories that may reveal glimpses into the historical King Arthur, if he existed, as well as insight into our modern times and how we perceive the legend today. 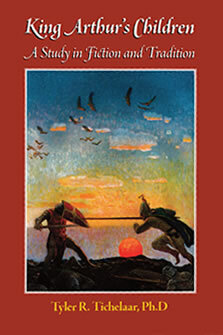 In conjunction with the website is the publication of my new book King Arthur’s Children: A Study in Fiction and Tradition, a study of the treatment of King Arthur’s children from the early Welsh legends, through the Middles Ages and to the present day in modern Arthurian novels. The book is currently available as a Kindle edition at Amazon, and printed copies in paper and hardback editions should be available by late January. 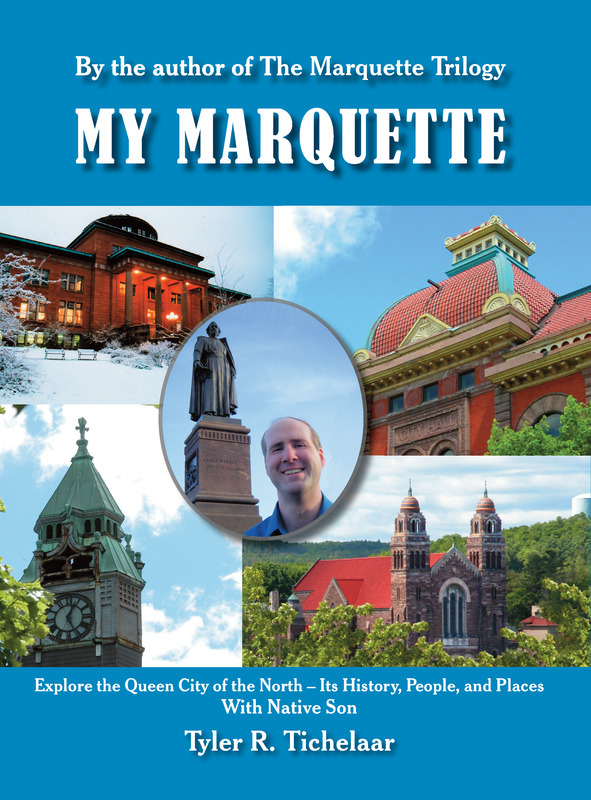 Of course, I will continue to write about Marquette, The Queen City of the North, both here on my blog as well as in producing future novels set in Marquette. Keep coming back for more information about Marquette and my books! Today, January 2nd, is the birthday of my great-grandpa Jay Earle White (1880-1963). So in his honor I’m posting the section from My Marquette that lists the houses that he built. While none of my ancestors were fortunate enough to live in the grand old mansions of Ridge and Arch Streets, my great-grandfather, Jay Earle White, was busily building homes for people throughout Marquette in the early 1900s. Amazingly, he learned carpentry through a correspondence course. I don’t know how many homes my great-grandfather built, but in the late 1990s, my Great-Uncle Jolly drove around Marquette with me, letting me know which houses he remembered his father building, some of which my great-uncle helped to build as a teenager in the 1920s. 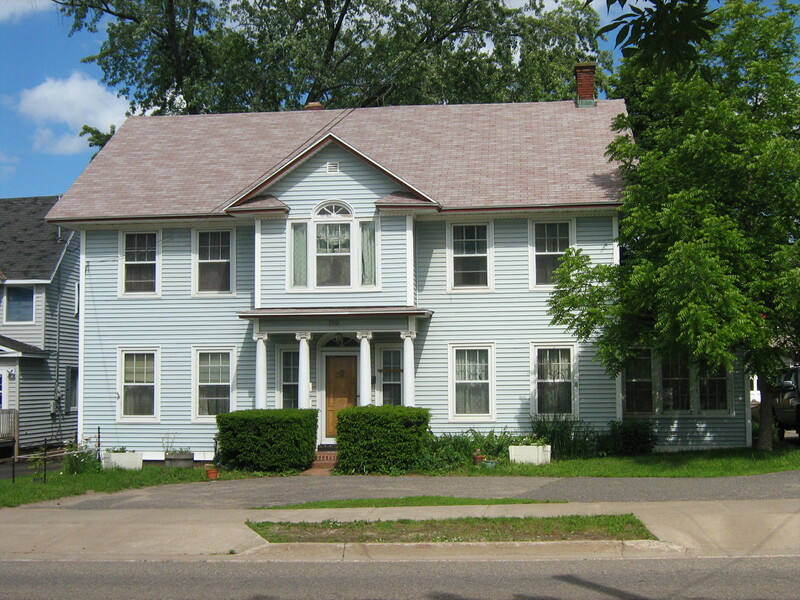 Most of the houses Jay Earle White built are in the residential East side of Marquette. Some of the homes he built are long gone, but those that remain, according to my great-uncle’s recollections eighty years later, are listed below with approximate dates for when they were built. I have not verified the accuracy of all these dates but simply submit them as my great-uncle best remembered them. 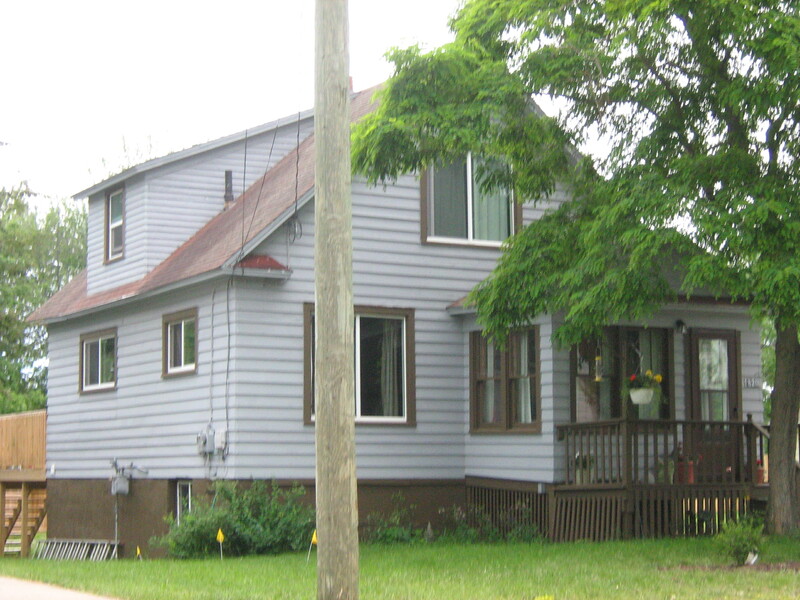 South Side Pioneer Road — a home on this street was built in 1927 for Fred Odett. 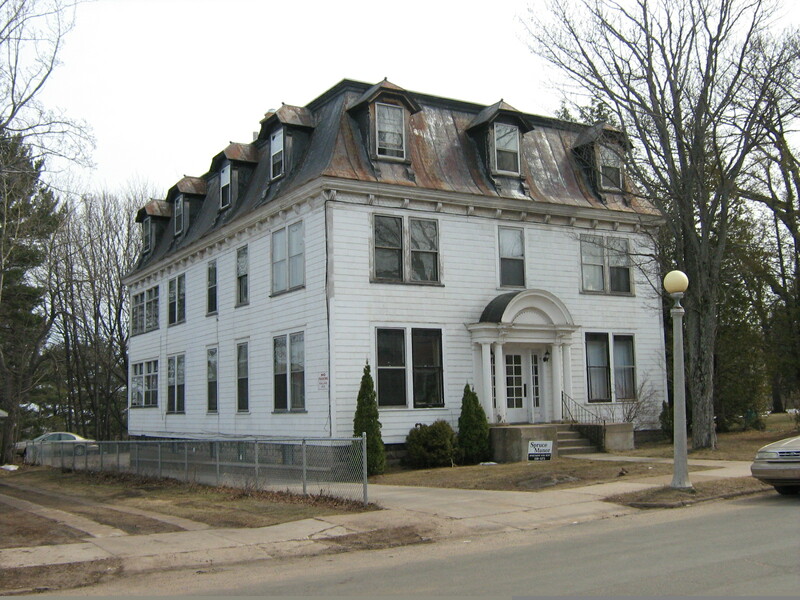 307, 323, and 325 College Avenue — these houses are just a couple of blocks from Marquette General Hospital, St. Luke’s at the time, and were built as homes for nurses. 400 Crescent Street — built about or slightly after 1927. 537 Center Street — built for the Duquettes. It is next door to my grandparents’ house at 1622 Wilkinson Avenue. 710 Front Street — built for Dr. Youngquist in 1924. 714 Spruce Street — the Huetter Flats, built in 1924, at the time a “modern” apartment building. Known today as “Spruce Manor,” it is still an apartment building. A building was located here as early as 1900 which was also apartments. 810 Front Street — built for John Robinson. 1041 Pine Street — built about 1925 or 1926. 1111 and 1116 High Street — built in 1927 for Charles Gustafson. 1820 Wilkinson Avenue — built in 1938 by Jay Earle White for his own family. My great-grandfather did a lot of other carpentry work including working as a cabinet maker at what was then Northern Michigan College. Great-Uncle Jolly told me his father never wanted to belong to the Carpenters Union because his work was so good people would pay him $1.00 an hour, and the union carpenters only made $0.75 an hour, so the union carpenters took up a collection to pay his carpenter dues so they wouldn’t have to compete with him and he’d get what they were paid. I wonder whether my great-grandfather ever considered that the houses he built would still be standing well into the twenty-first century. Over time, hundreds of people must have lived in these homes. His work lives on in his homes as well as in his family long after he is gone. You are currently browsing the MY MARQUETTE weblog archives for January 2011.